Samford University has received an additional $1.1 million grant from Lilly Endowment Inc. to further the work of the Center for Worship and the Arts. Housed in Samford’s School of the Arts, the center is advancing the conversation about teenage worshippers and teenage worship leaders. The founding director of the Center for Worship and the Arts, Eric Mathis arrived at Samford in 2010. He holds a Bachelor of Music from Wheaton College, a Master of Music and Master of Divinity from Baylor University and George W. Truett Theological Seminary and a Ph.D. in theology from Fuller Theological Seminary. Founded as anima in 2013 with the help of a grant from the Christ Is Our Salvation (C.I.O.S.) Foundation, the program recently revised its name to the Center for Worship and the Arts. 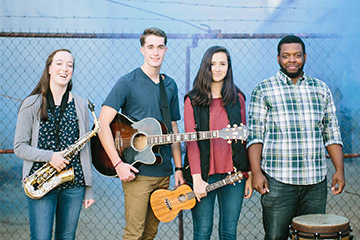 Animate, its flagship summer worship leadership program, retains its current identity. The center is celebrating its fifth anniversary and launching several new initiatives thanks to the additional grant, Mathis said. New program highlights are a Worship Leader Boot Camp for teenagers, allowing youth ministers and worship leaders to jump start their fall programming with teenage youth worship leaders; Student Worship Cohorts which will develop a deeper relationship with congregations participating in Animate; Student Worship Innovators which will engage church leaders in creating new resources for student worship; and new writing projects, including a book by Mathis under contract with Baker Academic Publishing. The center continues to provide online resources, an online certificate program with expanded goals and its summer program, Animate. Other center team members include Tracy Hanrahan, program director; Kara Young, coordinator of promotion and engagement; and three Faculty Fellows: Emily Andrews, instructor of church music and worship leadership; Joe Cory, associate professor of art; and Chuck Stokes, associate professor of sociology.